Comet® offers an exciting and fun way to learn spelling, based on dictionary meanings, world facts, geography, science, history, health and animals. 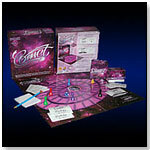 This expansion deck is designed for children ages 8 to 10 covering the same themes as the Family Edition of Comet. Awards: A TDmonthly Classics Award for being an all-time favorite toy. Awards: A TDmonthly Classics Award for being an all-time favorite children's product. — As of 7/21/2011 this product had 5 out of 5 stars from 1 review on Amazon.com. 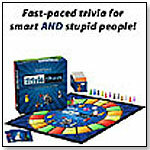 TRIVIATHON... fast-paced trivia for smart AND stupid people! Triviathon will have players singing, dancing, arm wrestling, cheering, cheating, and more as they compete in a game that puts each player's cognitive, physical, and social skills to the test, while they try to win a race moving at speeds of 0, 1, 2, or 3 spaces based on trivia questions they don’t even have to know the answers to. Made in the USA, this game is designed for 2 to 12 players. Triviathon has received the following awards: Creative Child Magazine’s 2009 Game of the Year; PTPA Media 2009; iParenting Media Award 2009; The National Parenting Center Seal of Approval 2009, NAPPA Honors 2009; and Dr. Toy's 100 Best Children's Products 2009. — "A trivia game that you can win without having to know the answers. Now some of us might agree that that is our kind of trivia game. Super fun and fast paced. A great choice for family game night. My own children are going to love this game!!" Jennifer Shuman, of 1SmartNoodle, told TDmonthly at Toy Fair 2010. The Sports of All Sorts Kit optical illusion eye-hand challenges provide hours of independent, brain-powered, sit-down sports fun. Kids find and crayon morphed shapes on distorted coloring pages to make color appear in the right place in the sports cartoon reflections. They complete the morphed picture, create their own morphed drawing, navigate a morphed maze, connect the dots, predict a reflection, and more. The activities help develop logic and perception skills, flex problem-solving mental muscles, exercise fine motor control, test spatial intelligence, and spark imagination and creativity. The kit contains 32 coloring page activities (“Soccer” is shown), two mirror-perfect Morph-O-Scopes (easy assembly), 16 non-toxic crayons, a Sports Kit Enrichment Guide to maximize learning, and instructions in English, Spanish and French — all in a portable “desk” convenient for travel. The activities engage boys and girls, kids, tweens, teens and adults, as they have universal, cross-cultural appeal. The Sports of All Sorts Kit is made in the USA and meets or exceeds all U.S. safety standards. It's the second Morph-O-Scopes Kit offered by OOZ & OZ, whose Circus Kit earned 19 national educational toy awards. The Sports of All Sorts Kit has received the following awards and honors: 2009 Dr. Toy Best Vacation Children's Products, a “Recommended” endorsement from the National Association for Gifted Children, 2009 The Toy Man Editors Choice Award, 2009 The Toy Man Award of Excellence, and 2009 The Toy Man Seal of Approval. “No other products on the market use OOZ & OZ's exclusive technology or have earned as many toy honors," Myrna Hoffman, managing director and chief morphologist of OOZ & OZ, told TDmonthly. Launch date: December 13, 2008. 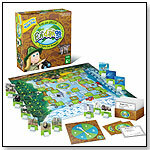 Endango™ is an environmental board game that teaches kids how to go green. With a unique game strategy, it links children's behaviors to their indirect environmental consequence – the fate of endangered animals. When playing the game, each player is responsible for three endangered animals in an environment. The points players earn as they navigate the human track affect the fate of the endangered animals in their environment. Positive points for “green behavior and knowledge” help save the animals; negative points for “less environmentally friendly behaviors” move the animals toward extinction. This product received a 2009 Parents' Choice Recommended Award. TykeLight GloMate by MOBI Technologies, Inc.
TykeLight GloMate by MOBI features an easy-to-clean surface that is soft to the touch, durable and impact resistant. The all-white GloMate, once illuminated, can turn a constant blue, green or pink; or rainbow-mode cycles between all three colors. Thanks to the built-in NmH rechargeable batteries and low-voltage charging base, TykeLight GloMate can provide up to 10 hours of constant light when fully charged. It turns on automatically when removed from the base, and the LED lights do not give off heat, so it’s cool to the touch. “Gentle Sleep” mode automatically dims and shuts off the light after 15 minutes. "The GloMate is not just a nightlight, but [also] a portable buddy for kids [that] is great for traveling and the perfect answer to 'Can you leave the light on?'" Dan Grody, publicist at Tellem Worldwide on behalf of MOBI, told TDmonthly. "It provides the perfect ambiance for nighttime feedings and it uses very little energy, lasting through the day or night on a single charge." 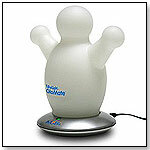 This item received a 2008 Greatest Products iParenting Media Award. Launch date: October 2008. Jishaku by RSV PRODUCTIONS INC. This portable strategy game is similar to chess or checkers, but with a twist — the magnetic stones with unmarked north and south poles can jump out of their position at any point during the game, giving players a whole new element of challenge. 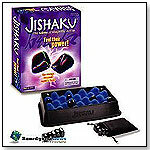 "Jishaku" is the Japanese term for "magnet." The game received a 2008 National Parenting Center Seal of Approval, an iParenting Media Award, a Major Fun Award and a Mr. Dad Seal of Approval. Launch date: June 3, 2008. — Tutoring Toy in Salt Lake City sells about 20 per month of this game, Buyer Casey Sartain told TDmonthly in fall 2009. Comet® Bible Edition offers an exciting and fun way to learn spelling and amazing facts about characters, angels, events and scripture. This particular version features questions and multiple choice answers such as "Who announced the birth of Jesus to the shepherds?" and "The spirit of God is described as descending like this." DOVE sparrow eagle raven. Multiple choice answers and an element of risk ensure everyone has a chance to win. Comet® has received awards from The Toy Man Online and Creative Child Magazine. "Spelling is very important, and far too few games offer this concept. Critical skill development is crucial, important and necessary to develop good educational performance," Creator Sandy Evans of Active Minds Inc. told TDmonthly. Launch date: Fall 2008. Viewing products 711—720 out of 1181 products.